Hello and welcome to JT Hughes Honda in Shrewsbury. 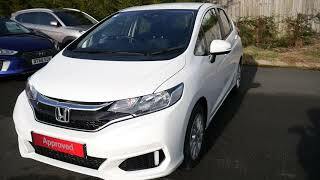 Today I'm going to show you around our used, very clean Honda Jazz we now have for sale. Now, this is the SE spec, finished off in the White Orchid, and is the 1.3 manual version. And this is an 18-plate, so it will come with the remainder of the manufacturer's warranty. You do have the option to upgrade that at to a further 12 months at a cost of £295. Start from the rear of the vehicle, it comes with rear integrated parking sensors. Moving on to the boot, it has got a large boot space. On the SE, you do get 15-inch alloy wheels as standard, and being the Jazz, it does come with Honda's patented Magic Seats. So a quick demonstration, the bottom lifts up and clicks into place. This gives you valuable storage space in the back of the vehicle. Being a Honda Approved vehicle, finance options are available, such as hire-purchase or PCP. And towards the front, it comes with LED daytime running lights, halogen headlights, and in the centre of the windscreen, you've got all your sensors and your cameras, and therefore the safety aspects of the vehicle. Moving on to the front, it comes with a multi-function steering wheel with built-in cruise control, automatic wipers and auto headlights as standard. It comes with Honda Connect 7-inch touchscreen with built-in DAB digital radio/CD player. Just below that you've got your air conditioning controls and your modern-day connection points, 6-speed manual gearbox and manual handbrake. Again, being a Honda Approved vehicle, service plans are available within our service department. If you've got any further questions at all, please give us a call back, and as always, we'll be happy to help.